In the heart of the state of the same name and surrounded by lush tropical vegetation and the high mountains of the southern Sierra Madre, Oaxaca is one of Mexico's most beautiful cities. Displaying an attractive mix of both Indian and Spanish elements, this UNESCO World Heritage Site has successfully preserved its unique character and is a delight to explore. First settled as far back as 6000 BC, it was part of the Aztec empire until the Spanish arrived in 1521 and soon after established the royal city of Oaxaca, a name derived from the original Aztec fortress. In addition to its fine architecture, travelers are drawn here for the city's rich cultural calendar, a highlight of which is the famous Guelaguetza, an indigenous festival held in July with plenty of traditional dancing, costumes, music, food, and crafts. Construction of Oaxaca Cathedral (the Cathedral of Our Lady of the Assumption) began in the mid 16th century and lasted almost 200 years. On the northwest side of the city's main square, the Zócalo, the cathedral is notable for its sturdy building style with its two low towers designed to withstand earthquakes, a not-uncommon occurrence in the region. The original clock, the mechanism of which is completely carved from wood, was presented to the church by the King of Spain upon its completion, just one of a number of attractive features of its pleasant Baroque façade with its finely worked figures and bas-reliefs on its columns. The interior is also worth seeing due to its neoclassical influences and eight finely-engraved glass windows. 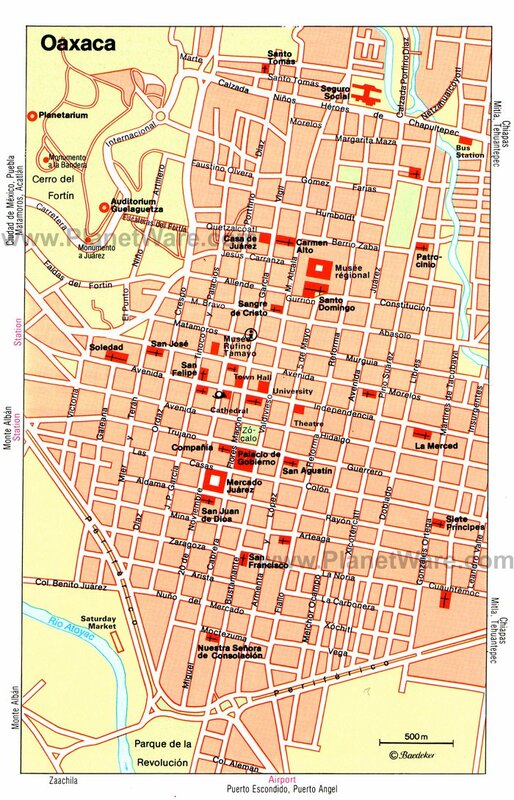 Many of the most important of Oaxaca's attractions are in the city's historic downtown core, an area centered around its central square, or Zócalo, the Plaza de Armas. In addition to its attractive bandstand, beautiful old trees, and cafés, it is here that many of the city's most important festivals and events are held, including the extremely colorful Fiesta de Rábanos - quite literally, the Night of the Radishes - which takes place here on December 23rd each year with festivities such as fireworks, dances, and parades spilling over to Christmas (and yes, there's even a radish-carving contest). Another important focal point is Mercado Benito Juárez, a colorful market that is especially lively on Saturdays when local Indios flock here to buy and selling everything from produce and woven articles to earthenware and leather goods. Other colorful markets include the daily Mercado de Abastos and the Mercado de Artesanias with its focus on textile goods. The splendid Iglesia de Santo Domingo, a Dominican church founded in 1575, is well worth taking the time to explore. Along with the adjoining convent, built with two-meter-thick walls to make it almost completely earthquake-proof, this large church complex is notable for the numerous niches filled with statues along its impressive Baroque façade. Inside, the church's walls and ceiling boast a wealth of gilded ornamentation and bright sculptures creating an overall impression that's more palace than church, while the rustic statues lend the nave and chapels a distinctive Mexican tone. Also of interest, in the ceiling above the entrance, is a vine from whose golden branches and leaves grow 34 portraits depicting the family tree of St. Domingo de Guzmán, founder of the Dominican order who died in 1221. Other highlights include its 11 chapels, the largest and most beautiful being the Rosary Chapel (Capilla de la Virgen del Rosario), which has its own choir and sacristy, and a lavishly decorated altar with a figure of the Virgin Mary that's considered a jewel of Mexican Rococo. The historic settlement of Monte Albán, just eight kilometers west of Oaxaca, covers an area of some 40 square kilometers and for 2,500 years was an important place of worship. The center of the ruins, rising on a man-made platform 400 meters above the Oaxaca Valley, is possibly Latin America's oldest and most impressive Pre-Columbian site. Founded in the sixth century BC, the city was once home to some 35,000 people in its heyday. 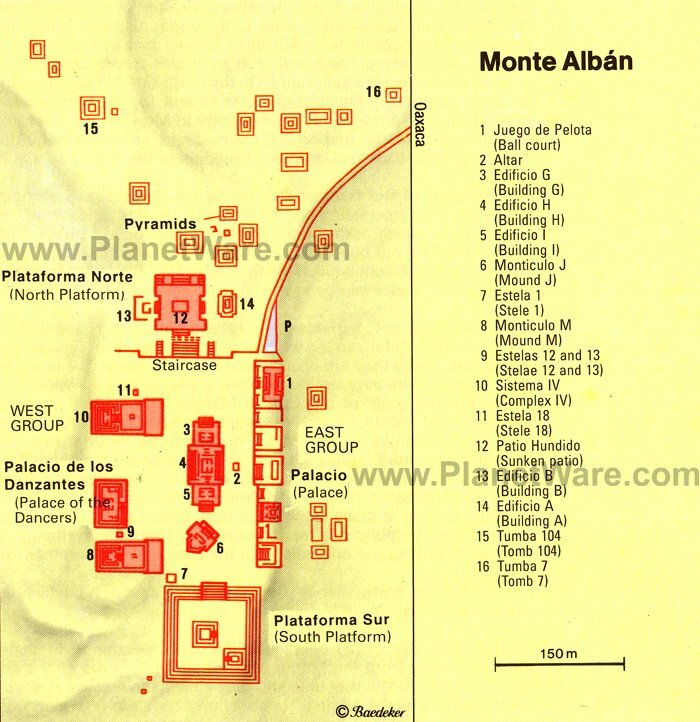 Highlights include the spectacular Grand Square (Gran Plaza) measuring 200 meters wide by 3,300 meters long and forming the center of the archaeological ruins, along with the Ball Court (Juego de Pelota), a number of large pyramids, and a palace with an inner courtyard and cruciform tomb. Expect to spend the best part of a day exploring the ruins and the Monte Albán Ruins Museum with its sculptures, ceramic figures, jewelry, and displays relating to the excavation of the site. The Basilica of Our Lady of Solitude (Basílica de Nuestra Señora de la Soledad), dedicated to the patron saint of Oaxaca, was constructed of green cantera, a stone unique to the area, between 1682 and 1690 and is one of the city's finest religious sites. In addition to its atrium built from limestone blocks surrounded by a covered walkway, it's also notable for its figure of the Virgen de la Soledad with her black robe of velvet embroidered with gold and other precious stones, including a large pearl on her forehead. Other notable nearby churches include San Felipe Neri with its many elaborate altars, San Juan de Dios with an Indian depiction of the conquest, and San Agustin, notable for its façade reliefs of St. Augustine. The Rufino Tamayo Museum (Museo de Arte Prehispánico Rufino Tamayo), presented to the state by famous Mexican artist Tamayo, lies in an old palace just a short walk away from the Zócalo. In addition to displaying archaeological objects from Mexico's many Indian cultures, this rich collection of Pre-Columbian art was established to ensure the more than 1,000 historic artifacts collected over Tamayo's lifetime remained intact and safe from illegal traders. Also worth a visit is the Graphic Arts Institute of Oaxaca (Instituto de Artes Gráficas de Oaxaca, or IAGO), founded by another Mexican artist, Francisco Toledo, and containing numerous fine paintings from across Latin America, as well as a cultural center, a library with many rare manuscripts, and a music library. The humble looking home at García Vigil 609, now a museum, is famous in Mexico for being the place where much revered President Benito Juárez lived as a servant from 1818 until 1828. Don't be deceived by the home's rather plain exterior. Inside, the complex opens up into a large central courtyard and houses Museo Casa Juárez, a large museum containing related memorabilia (the President was in fact born in 1806 in nearby Guelatao). Also of interest is the museum's portrayal of the daily life of both working and middle classes in the 19th century, as well as the period furnishings in the dining room and kitchen. Just 12 kilometers south of Oaxaca is the small town of Cuilapan de Guerrero, once famous for manufacturing cochineal, a brilliant red dye made from the insects of the same name. These days, the town is an important tourist destination thanks to the splendid old Church and Monastery of Santiago Apóstol. This enormous hillside structure was started in 1555 and is notable for its Renaissance façade and two inner colonnades, part of which collapsed in an earthquake, and a stone pulpit reached by a small flight of steps. Although abandoned in 1663, its three-meter-thick walls have stood the test of time, as have the murals in the entrance depicting the history of the order. The terrace on the second floor, where the monks' cells were located, offers great views, and on the rear wall, an interesting stone plaque bears both the Pre-Columbian calendar inscription "10 reeds" as well as the Christian year 1555. In the church, the only part of the complex still used, the most interesting feature is the tomb of the last Zapotec princess, the daughter of the ruler Cocijo-eza. A short drive east of Oaxaca is the small village of Santa María del Tule, famous for the ancient Tree of Tule (Arbol del Tule). This massive cypress tree, 40 meters wide and 42 meters tall, stands in front of a charming little church and is estimated to be 2,000 years old. A further 10 kilometers away is the equally interesting town of Tlacochahuaya, home to the 16th-century San Jerónimo Church. Highlights include its richly decorated interior crammed full of colorful paintings created by local Indians who portrayed their artistic and religious ideas with paintings of stars, flowers, birds, suns, and angels. The Museo Regional de Oaxaca is housed in the former convent to Iglesia de Santo Domingo and is well regarded for its excellent collections related to native culture, as well as for its ecclesiastical and secular exhibits from the colonial period. The superb ethnological collection includes costumes, masks, jewelry, ceremonial and household implements belonging to the Indian tribes from the region, together with archaeological finds from surrounding ruins. The highlight of the archaeological exhibition is the Mixtec treasure trove of gold, jade, turquoise, and other semi-precious stones found in 1932 in nearby Monte Albán, and from which elaborate bracelets, necklaces, earrings, breastplates, and masks were produced. Historical documents and items from the old church and the convent, including the refurbished old Spanish kitchen, are also of interest. Hotel La Casona De Tita: boutique luxury, colonial style, peaceful courtyard, delicious breakfast. Casa de Siete Balcones: three-star boutique hotel, historic center location, beautiful old building, fresh flowers. Holiday Inn Express Centro Historico Oaxaca: mid-range pricing, modern style, comfortable beds, hot tub and outdoor pool. Casona Oaxaca: budget-friendly rates, great location, charming courtyard, laundry service. Given Oaxaca's subtropical location in the beautiful Oaxaca Valley, there's no shortage of fun day trips to the splendid countryside surrounding the city. One of the nicest is to the town of Dainzú, just 20 kilometers east of Oaxaca and the location of a settlement inhabited from about 500 BC until AD 1400. One of the most important of its buildings has a pyramid-shaped base and is built in a style similar to that of the north platform at Monte Albán. A few miles away is Lambityeco with a small pyramid along with seven ancient tombs, including one with two heads and names chiseled into its façade. Another small town worthy of a visit is Huijazoo, just a short drive north of Oaxaca, where nine tombs were discovered, the most remarkable being Tomb 5, notable for the serpent mask forming its entrance and an interior furnished with sculpted columns and colored murals depicting rulers or priests and dating from the 8th to the 10th centuries. Finally, be sure to visit the ruined site of Mitla, on the edge of the village of the same name, just 40 kilometers to the east of the city center. One of Mexico's most famous archaeological attractions, this fascinating site includes elaborate stone ornamentations unsurpassed in the history of Mesoamerica. Highlights include the Hall of Columns with its altar, and the Patio de las Grecas, a small inner courtyard surrounded by long narrow rooms where the city's high priest lived.